Love roasted red peppers and roasted garlic? How about the two of them blended together with cheesy nutritional yeast? Sounds pretty good, doesn’t it? 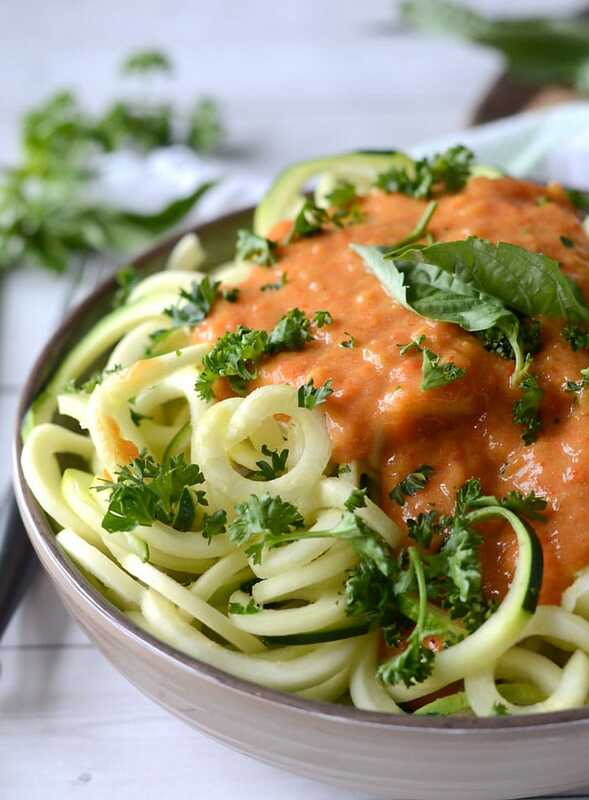 Well, these roasted garlic and red pepper zoodles combine all three of those ingredients into one healthy, low calorie, plant-based meal that’s packed with flavour and nutrition! I go through zucchini at my house like it’s my job. I eat it almost every day and it’s always on my grocery list. I love using it in baking, eating it raw, fried, baked and my favourite, turning it into crunchy, fresh, zucchini noodles! I’ve shared quite a few zoodle recipes on the blog so if you missed those, be sure to check them out below. I love how much nutrition and volume zucchini provides for such little calories. High volume win. 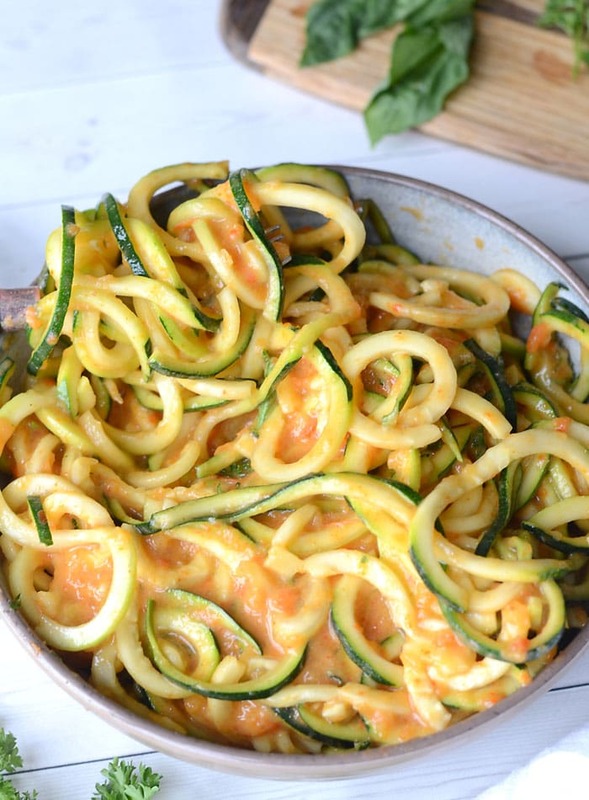 Zucchini isn’t just the perfect low carb alternative to pasta but it provides fiber, B vitamins, vitamin C, potassium, folate, vitamin A and manganese, all important nutrients we should load up on for general good health. It’s also been shown to improve arterial health as well as have anti-inflammatory properties. In addition, zucchini is such a low calorie food it’s a good choice for helping to maintain body weight. Inflammation has long been known to play a role in allergic diseases like asthma, arthritis and Crohn’s disease however chronic inflammation may also contribute to Alzheimer’s, cancer, cardiovascular disease, diabetes, high blood pressure and high cholesterol levels. In addition to poor diet, lack of stress management, build up of toxins and a sedentary lifestyle also contribute to chronic inflammation in the body. Chronic inflammation is rampant in our society today, in large part to a nutritionally-poor diet but luckily, we can prevent and reduce inflammation through lifestyle choices. To start reducing inflammation, you should try to minimize or eliminate the following foods from your diet. The easiest way to reduce the amount of these foods in your diet is to ditch processed foods asap. Overly processed foods typically contain modified corn and soybean oils, refined sugar often in the form of high fructose corn syrup, refined carbohydrates as well as trans fats. Cut those out and you’ll have a great start on reducing inflammation. Next you can start eating foods that have anti-inflammatory properties. This is easier than you think! By sticking to a whole food diet, you’ll naturally be consuming foods that have anti-inflammatory properties, just like zucchini! Any of those foods are a great place to start and hopefully you’re consuming some if not all of them already! Even if you eat meat, the base of your diet should still be plants. By including plenty of plant foods at every meal, you’ll be well on your way to preventing chronic inflammation. Note the dark chocolate! Heyo! There are a few steps to this recipe but overall, it’s very easy. 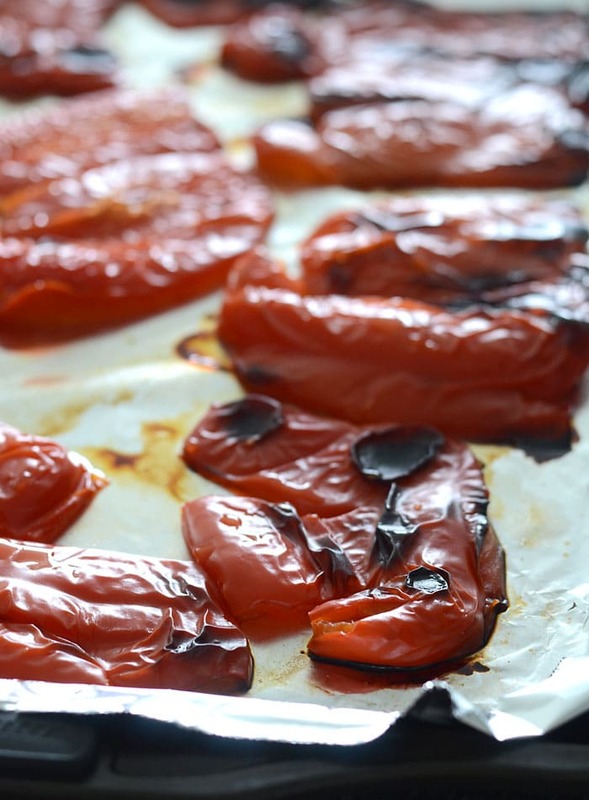 If you’ve never made your own roasted red peppers at home, it’s very easy to do. While your garlic and red peppers are roasting, you can prep the zucchini noodles or even make them ahead of time to speed up the time needed to make this. I left my zucchini noodles raw for this recipe. I like them crunchy and this saves time since there’s no cooking involved once you make the sauce. If you prefer to cook them, simply add them to a pan and cook for about 5-10 minutes until they soften a bit. If you’re cooking them, you might want to squeeze the water out of them before hand. I didn’t do this for my raw noodles and after it sat in the fridge it was a little watery but I just drained it off and it was fine. If you want to get the excess water out of the zucchini first, follow the tips in this post for better zoodles. As for the roasted red peppers, they’re a cinch to make at home, can be made without any oil and they taste great! Line a baking sheet with foil and place the peppers on the sheet with the inside facing down. Smash each pepper on a top rack in the oven until the skin starts to turn black and bubble. This usually takes about 15-20 minutes. Remove from the oven and fold the foil over the peppers, or place another piece of foil on top to seal them in. Let them steam in the foil for 10 minutes or so. Once they’ve steamed inside the foil, open it up and peel off the skin. It should come off quite easily. You might want to let them cool a bit so they’re easier to handle. You can use this delicious, healthy sauce over any kind of noodles. Roasting the garlic and red pepper really amps up the flavour. Once they’re roasted, they’re blended with cheesy, nutty nutritional yeast, onion and vegetable stock for a high-protein, low fat and carb pasta sauce that still delivers on flavour. It would be really nice over some steamed veggies, spaghetti squash or even roasted potatoes! 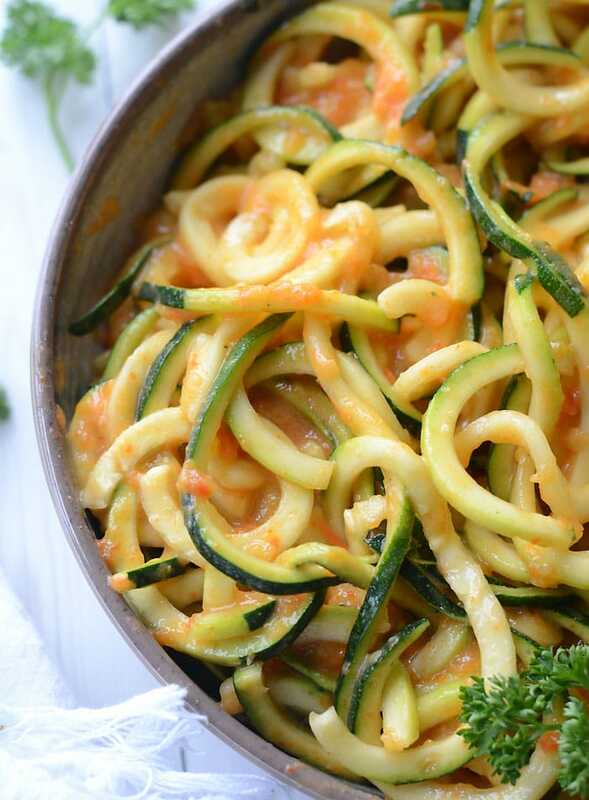 These roasted garlic red pepper zoodles are low in fat and high in protein thanks to added nutritional yeast. Roasting the garlic and peppers adds a ton of flavour and creamy texture without adding oil or extra salt. This recipe is a lighter, low calorie way to satisfy a pasta craving! 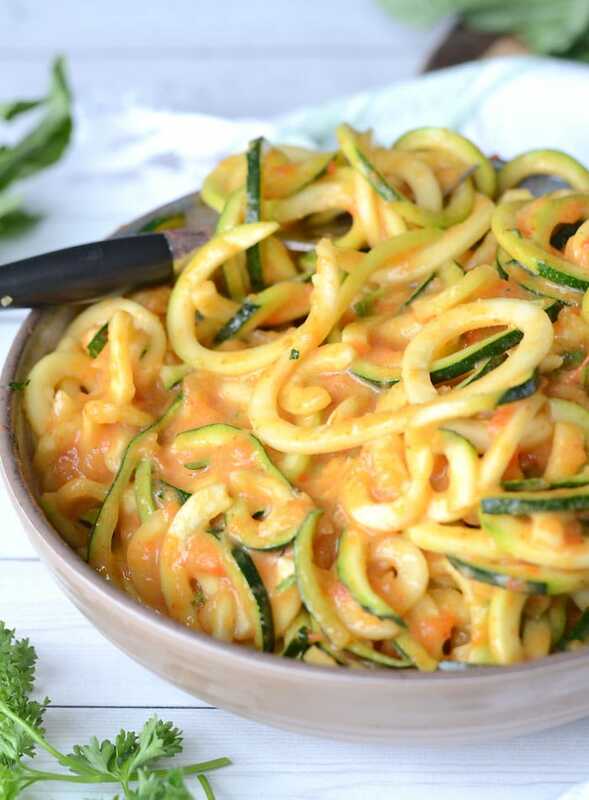 If you’re not a fan of zoodles, feel free to use the sauce over your favourite pasta, steamed veggies or baked spaghetti squash. Add the roasted red peppers, garlic, nutritional yeast and onion to a food processor or blender and mix until smooth and creamy. Taste and season with salt and pepper if needed. 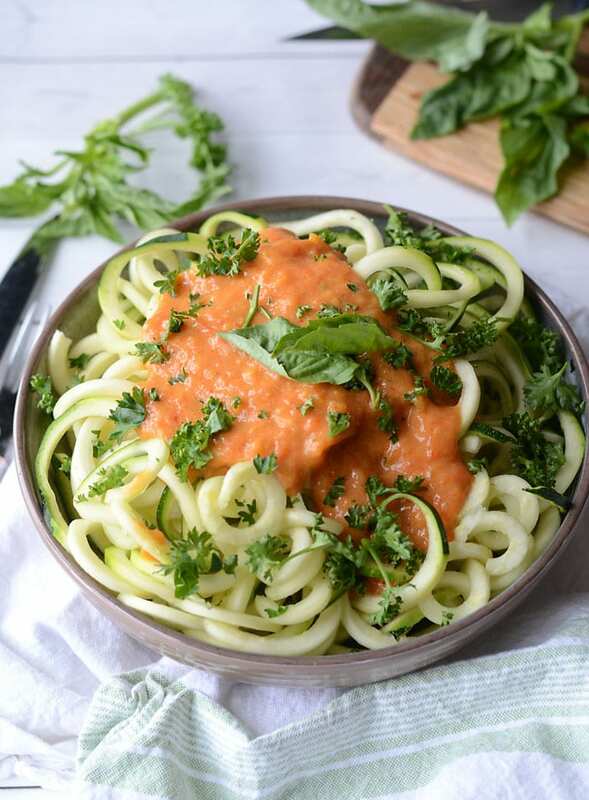 Top zucchini noodles with the sauce and serve with fresh parsley and basil. 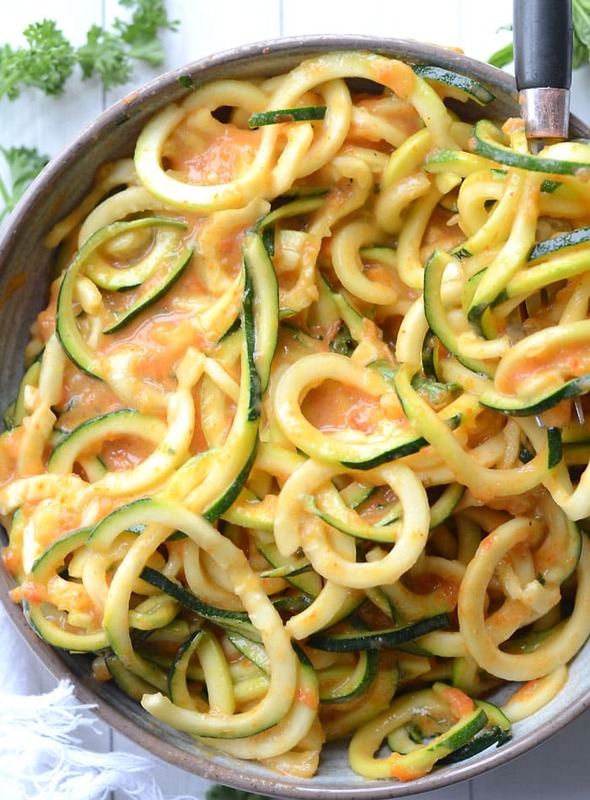 You can use raw zuchini noodles or cook the zucchini noodles in a pan for 5-10 minutes. To make the roasted garlic, cut the tip off a bulb of garlic to expose the cloves a little. Wrap each bulb up on tin foil, pouring 1/4 tsp of olive oil over each one. Roast in the oven at 400 F until the bulb is soft, approximately 35-45 minutes. 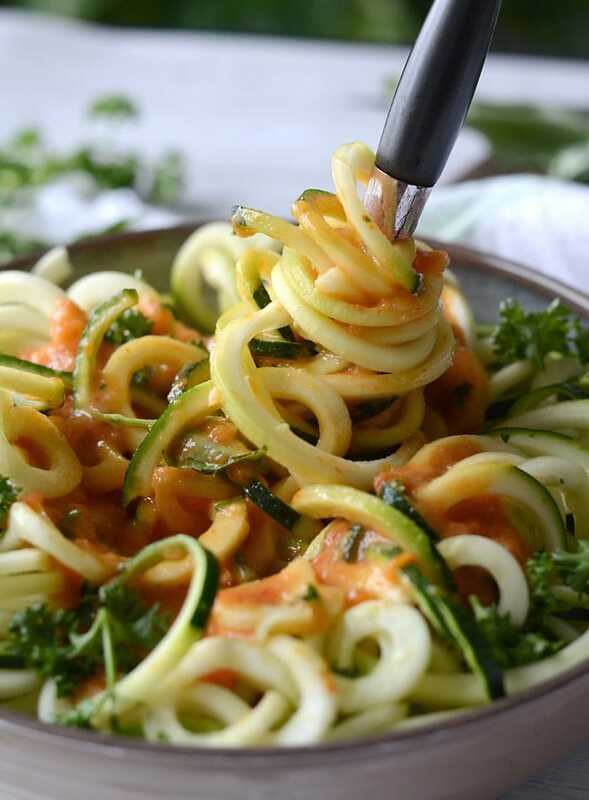 To make zucchini noodles, pick up a spiralizer on Amazon. Love me some zoodles. I generally like them raw as well. This sauce sounds yummy! Really pretty as well! I found the onion to be WAY over powering, and I only used half a red onion. I unfortunately had to add jared tomato sauce to fix this. I would recommend lowering the amount or roasting or sautéing onion first. Thanks for the feedback, Vanessa. I’ve made this a few times now and didn’t find the onion to be overpowering, in fact I couldn’t really taste a lot of onion! I’ll give it another go and see if I need to adjust the recipe. Thanks for the comment, it’s helpful to others! I have to agree. I only put half of a red onion in it and it was wayyyyy overpowering. Hmmm, I guess I’ll have to make it again and see what happens…or maybe some people are particularly sensitive to onion?! I’ve had quite a few good reviews on social and I don’t find it overpowering at all. Thanks for your feedback for other readers! is there a substitute for nutritional yeast? For this particular recipe, not really. It really makes the sauce! I can’t think of anything you could use instead, sorry..
Hmm, that is too bad! Not sure about using the yeast. Should I use 1 packet of yeast ??? Make sure you don’t use baking yeast! Nutritional yeast is completely different. You should be able to find it either in bulk foods, or in the health/natural foods section or at a health food store. Or you can buy in online. It’s yellow in colour, flaky, can be eaten on it’s own and has a nutty, cheesy flavour. Did you maybe mean 2 cloves of garlic instead of bulbs? I made this according to the recipe as written and reduced the garlic to 1 bulb and the garlic was still extremely overpowering, not the onion. I used two full bulbs in mine. I’m not sure why things are coming out so overpowering for you guys, maybe I just like onion and garlic too much! Maybe a note about it in the recipe is a good idea as a few of you have mentioned it now. Thanks for the feedback. Good, but next time I will leave out the onion. I am not a Vegan, but I have never like meat since I was little. I have been veggies all my life. This is a great new recipe that I will be cooking more often. I added an avocado to make it creamy, and oh my goodness it blew me away! Ya, that makes sense. I pretty much only use white and yellow onions now too, I should add that to the recipe…and to make sure you roast the garlic long enough! Thanks! Wow this looks amazing! And I love all the food info you added. ???? Just wondering what to set the oven to in order to roast the garlic, sorry I am one of those people who follows things pretty much exactly or I mess it up. Thank you! Hi! Just wondering…It says yield 6 but the nutrition info says it’s 4. Which is it? Excited to try this recipe! It could be 6 smaller servings but for us, it’s 4 servings, which is what I used for the nutritional info. Thanks, hope you like the recipe. Really wish there was instructions of cooked zoodles for those of us that like then cooked. Also, really wish there were more instructions on temps on the roasting and broiling. Just some missing info. Hi Morgan, for cooked zoodles I’d suggest cooking them in a pan for 5-10 minutes over medium heat. Broiling is typically set at 500 degrees F on most ovens and the garlic can be roasted at 400 degrees. I actually have the suggestion for cooking the cooking the zoodles and the steps for roasting the red pepper writing out in the blog post above the recipe. Thanks! When/where do you add the vegetable broth? It’s under ingredients but it doesn’t get mentioned in the instructions. It goes in the food processor with the rest of the sauce ingredients. Enjoy! Where does the vegetable stock come in? I see it in the ingredients but don’t see it in any of the steps? It gets added to the blender with the rest of the ingredients. I’ll add that, thanks! Enjoy!